Spring has officially arrived! Whether you are a college student headed to the beaches for spring break or a working professional looking forward to your summer vacation, you will want to look your best as the weather warms up and you spend more time outside with friends and family. If you have stained or yellow teeth, however, you may feel too embarrassed to smile, speak or laugh around others. Fortunately, advances in modern cosmetic dentistry mean that a beautiful, white smile is easily within your reach. Want to know how? Here is everything you need to know about Deep Bleaching and in-office teeth whitening. Deep Bleaching is a revolutionary teeth-whitening technique that can lift seemingly-impenetrable stains to give you a radiant white smile! By utilizing custom-made trays that provide a hydraulic force to push bleach into the teeth, Deep Bleaching can transform teeth up to 16 shades brighter. The patented Deep Bleaching gel is kept refrigerated from manufacture to office delivery, ensuring that it retains its potency and ability to remove even the deepest stains. A sparkling-white smile with Deep Bleaching can be achieved in a matter of weeks through a combination of in-office visits and at-home sessions wearing the special whitening trays. The stunning results of Deep Bleaching just simply cannot be matched by any other professional whitening system on the market. Despite these advantages, some patients still opt to pursue other teeth-whitening options – especially if they want faster, more immediate results. For those who cannot commit to the combination of in-office and at-home sessions required by Deep Bleaching treatment, in-office teeth whitening offers a viable alternative. In-office teeth whitening is ideal for the busy individual who wants to brighten their smile without the inconvenience of wearing bleaching trays. The treatment uses a full-mouth bleaching light combined with a specially-formulated light-activated gel to make teeth 6 to 10 shades lighter. In less than one hour, you can walk out of the dentist’s office with a dazzling white smile! Whether Deep Bleaching or in-office teeth whitening is right for you will depend on the condition of your teeth and the results you desire and should be determined in consultation with a dental professional. The most important thing is that you do not let flaws in your smile keep you from living life to the fullest. 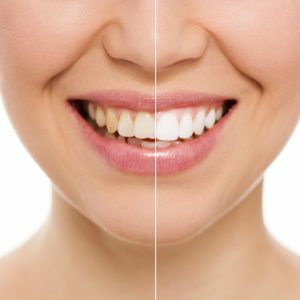 If you want a radiant, confident smile that will turn heads this spring, talk with a dentist in Randolph today about the best professional teeth whitening treatment for you. Dr. Glen Goldstein has 30 years of experience helping men and women achieve the beautiful smiles of their dreams. A graduate of the prestigious Dawson Center for Advanced Dental Studies, he offers Deep Bleaching treatment and in-office teeth whitening at his conveniently-located Randolph practice. Patients interested in brightening their smiles should visit the Randolph Dental Care website or call Dr. Goldstein at 973-895-7995.